Of the 10 films director Tod Browning made with silent screen legend Lon Chaney, 1927's The Unknown is considered by many the best of the bunch. To be sure, the movie boasts one of Chaney’s strongest performances, portraying a character equal parts hopeless romantic and dangerous psychopath. Alonzo (Chaney), an armless knife thrower who performs with his feet, is the star attraction of the Zanzi traveling circus, and is secretly in love with Nanon (Joan Crawford), the circus owner’s daughter. Nanon, who has a strong aversion to being touched (she pulls away whenever a man tries to embrace her), in turn feels she can trust Alonzo because he has no arms. Yet Alonzo is not what he appears to be. Wanted by the police, he is a killer who actually has arms, but conceals them beneath his shirt. Fearing he may lose Nanon to Malabar the Strongman (Norman Kerry), who is also trying to win her affections, Alonzo resorts to blackmail and even murder to ensure that he, and nobody else, will possess the love of his life. Alonzo is a character of extremes, in both action and emotion, and it’s Chaney’s facial expressions that convey these extremes so convincingly. When Nanon, who's just rebuffed Malabar's advances, breaks down in Alonzo’s cabin, Alonzo cries right along with her, moved by her pain, but also by the tenderness he feels for her. Moments later, when Nanon’s father, Zanzi (Nick De Ruiz), bursts in and confronts Alonzo for “putting crazy ideas” into his daughter’s head, the love in Alonzo’s eyes immediately drains away, and is replaced by hostility and rage. His feelings grow more sinister over time, and as jealousy, coupled with the realization he may never win Nanon’s heart, get the better of him, Alonzo becomes a shell of a man, his sanity slowly slipping away. 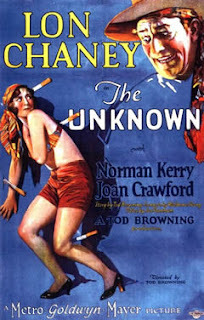 The Unknown is a fine film for many reasons, from its realistic circus setting (which Browning would return to in his 1932 movie, Freaks) to Joan Crawford’s heartfelt turn as Nanon. But it’s Chaney who will command your attention. When he's on-screen, you won’t want to look away. Who else but Lon Chaney could evoke our deepest sympathies one moment, send a chill running up our spines the next, and accomplish both with nothing more than the look in his eyes? A master of pantomime, Chaney once again demonstrates in The Unknown why he so deserved the moniker "The Man of a Thousand Faces". Amazing. I can see how Lancaster, a gifted athletic actor, would be influenced by Lon Chaney's performance. I'm reminded of Burt's performance in The Swimmer and of how we're seduced by his animal vitality as he swims cross-country through his neighbors' pools only to discover at the end of his lark (along with his character) his dissolute soul. Steven: Thanks for the comment! That's a good point about Lancaster: despite his reputation as the Man of a Thousand Faces, Chaney was also a very physical actor. I admit I've yet to see THE SWIMMER, but have heard some great things about it. Sounds like a movie I'll definitely have to track down. Definitely one of Chaney's greatest. He really takes this movie beyond a horror film, showing us the mind of a tortured human being. Once seen, never forgotten. @grandoldnovies and joey: My sincere apologies for the late reply! @grandoldmovies: I agree... one of Chaney's finest performances! @joey: Thanks! Glad you liked it, and I agree with you 100%. This one's a classic!